This week, while working on a project for an upcoming magazine issue, I ran into a little problem. The drawer fronts I worked on were too small to easily hold as I hand-cut the dovetails. I had just enough room to clamp my front as I sawed for tail sockets and during waste removal I could have moved the clamp halfway through, but that was time consuming and monotonous. So I opted for help. Many of you recognize the apparatus shown above as Christopher Schwarz’s Moxon Double-screw Vise. I was a big fan of it when he wrote about on his Popular Woodworking Magazine blog back in June 2010, and continue to sing its praises. (You can read his post here.) This bad boy gets used whenever I have a stack of drawer parts on which to hand-cut dovetails – it saves my back so the only pain I feel when building some projects is a bit farther south. Instead of sawing to define pins and tails, this time I used the vise to hold parts as I removed waste. (Something I most often do with the part lying flat on my bench.) To do this I had to modify the vise. I wasn’t at all interested in any permanent changes, so I simply added a small shop-made jig to the large shop-made jig. 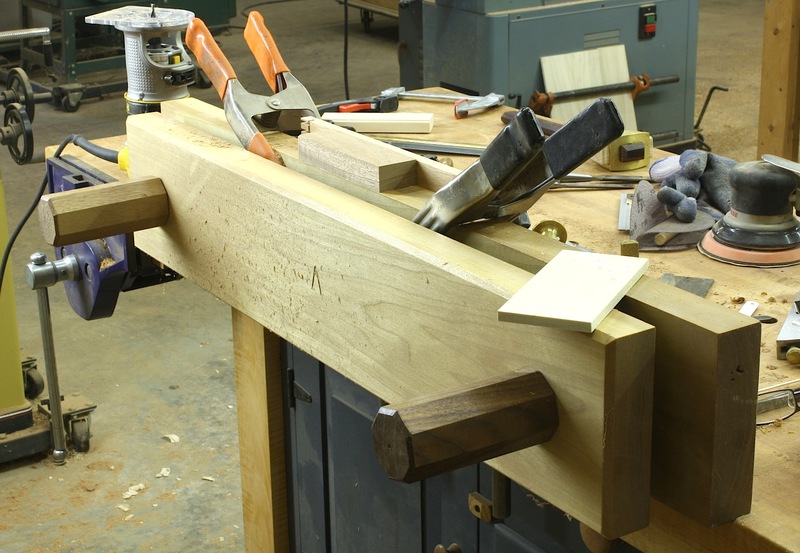 The piece you see spring-clamped to the rear member of the Moxon vise is L-shaped scrap assemblage where the back piece extends far enough beyond the ends of the top piece so as to get clamps in place. The top piece then acts as a support for my trim router. Using this arrangement is quick and simple to use. 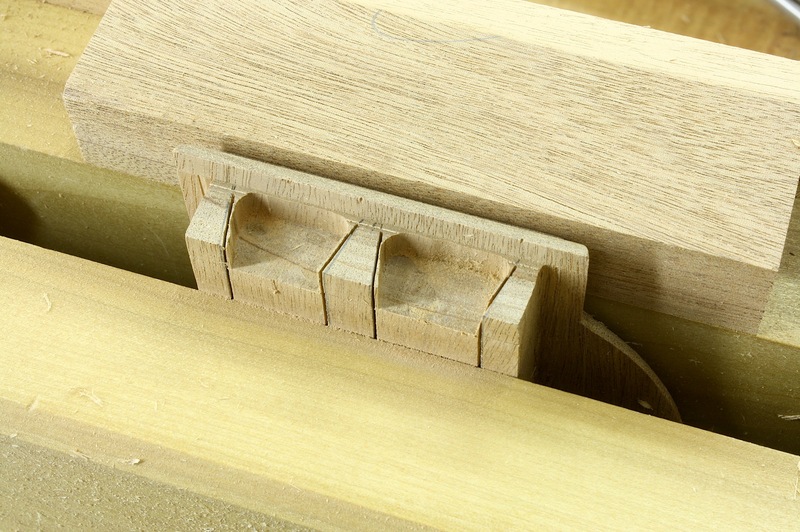 Load a drawer front into the setup, level the front using a small flat scrap as shown in the photo to the right then twist the two hand-screws tight to secure the workpiece. That’s all there is. 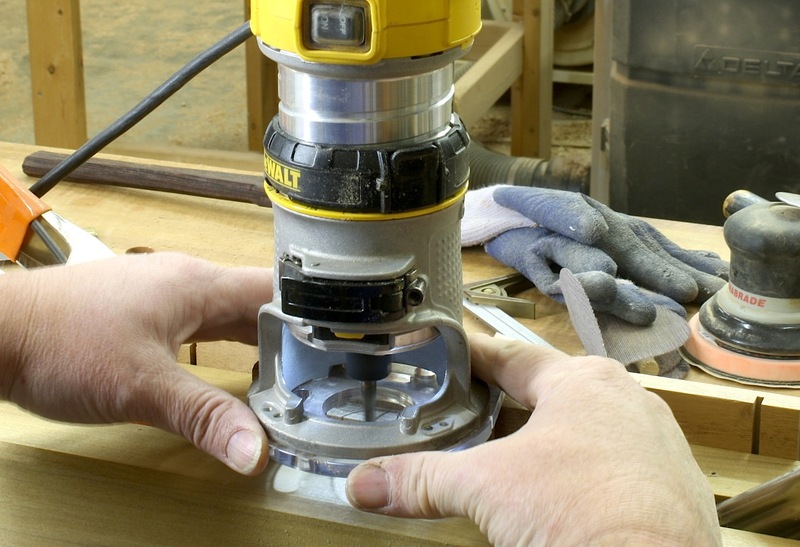 My trim router sits atop the added jig and sits level as waste is removed from the drawer front. 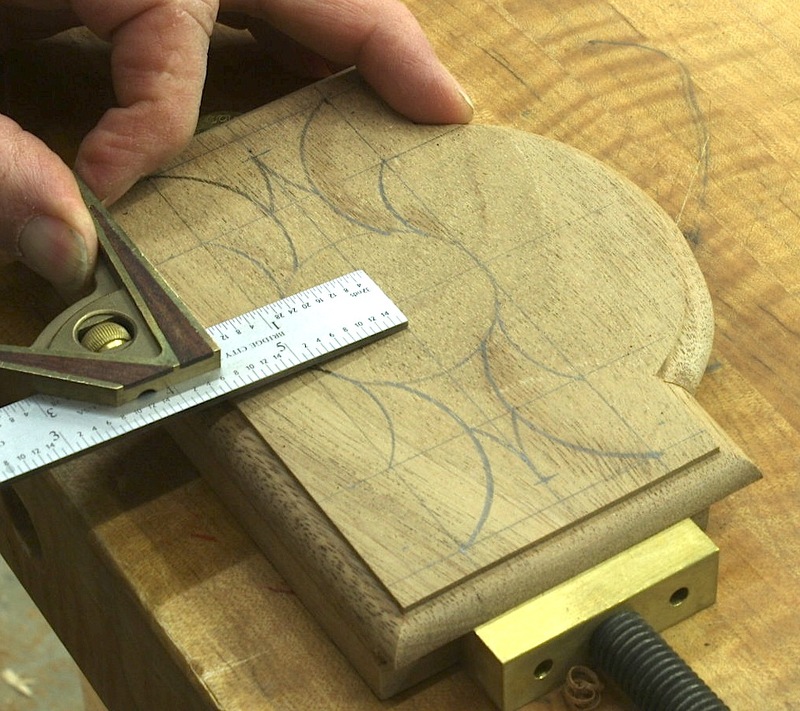 Just as demonstrated back in August of last year in “Dovetail Evolution”, you freehand guide the router to remove waste. The work is easy as long as you stay clear of your layout lines and saw cuts. 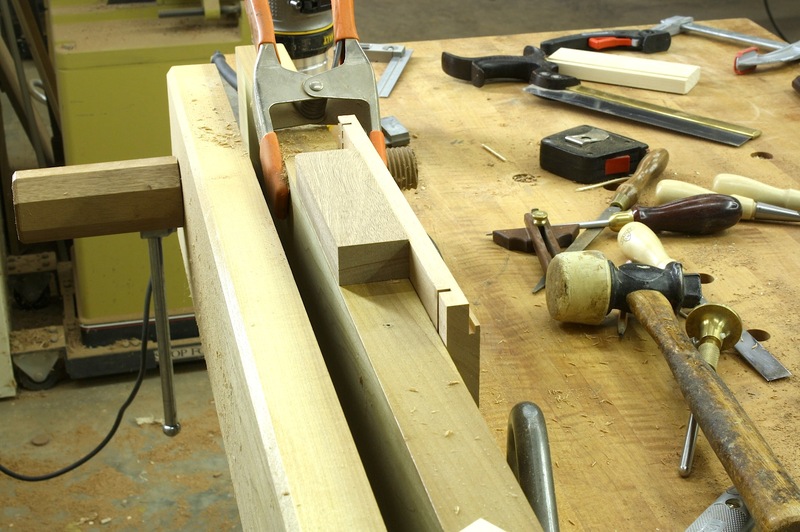 As you can see below, after the router work is complete all that’s left is to chisel away the remaining waste – work that is completed with the front still clamped in the vise. 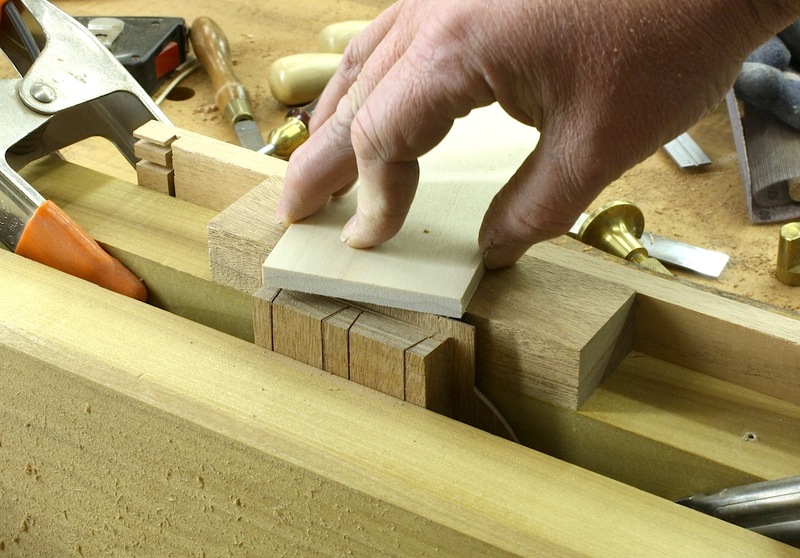 Notice this time I’m working with half-lap dovetails whereas in the earlier post I worked through dovetails. Setup is a bit different, but results are equally great. PS. Next week I promise that my post includes zero router work.